Here at 9,000 feet in the Rockies May is opening with icy winds and the last (we hope) of the snow swirls and mini-blizzards. There really isn't much heart in this snow. It blows and drifts and then melts immediately in the sudden 50 degree sunshine. Only to return for a final, fitful round, exploding last year's leaf piles, making walkers run with the freshening winds at our backs. It's kite weather. And, it is the moment in our small ecosystem when the traditional harbinger of May is literally, poised upon the wind. May Day officially heralds the return of the first hummingbird to Wiseacre, our land between the East River and Cement Creek. Just as I am writing these words, she—and the females are always fearlessly first—begins buzzing my study window. At first, even though I know she is soon to arrive, know to watch for her, I am always taken by surprise. In the wind and snow, she looks just like a leaf, twirling in the updraft. Then I catch the flash of her brilliant eye. SWOOP! She is dive-bombing the location where her feeder should be. Then, she buzzes every window of the cabin, hovering with irritation, looking for the manna from heaven, the gold that should be here, at the end of the trail—Nectar! I rush to fill the feeders with water and sugar. I have not put the feeders out yet because three decades of celebrating this homecoming have taught me, if hung outside prematurely, the water is going to freeze. The timing has to be perfect. 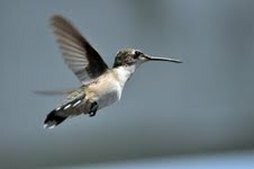 Many of the female hummingbirds who come to our valley have traveled over 1,500 miles from as far as Mexico. And, they do not feed along the way. When they get here, they need to find nectar, even in the snow. There is very little for them to feed upon at this time of year. Most of the bountiful high country wildflowers are at least several months from blooming. After this incredible journey the females must begin the business of gathering fur and small twigs for their pouch-shaped nests. Their male partners are still warm and sated in Mexico. The females are frantic to create nests, prepare for partners and ready everything for egg laying time. There seems to be little for them here, and yet, they come. An ornithologist at the Rocky Mountain Biological Lab, situated in the old mining town of Gothic, just above Crested Butte, told me an incredible story. She said that she had leg-banded a young female the first year she, the scientist, came as a grad student to the lab. And 14 years later this same hummingbird was still returning to the exact meadow, to her unique and particular habitat in the Elk Mountains. At 14 years and still on the wing, this Elk Mtn. Hummingbird was believed to be the oldest ever documented. The joyous coming together of the young, spring-mad masculine and feminine begins the choreography of the mating rituals, seen in all of Nature around us. MAY YOU RECLAIM THE JOYOUS FLEXIBILITY OF YOUTH WITH MAY! IN CELEBRATION OF BELTAINE IN OUR CONTEMPORARY WORLD Please read the Poem HOME STUDIES by Irish Belfast poet Mark Madden. Like the hummingbird, drawing sweet nectar from many disparate places, Mark has drawn iconoclastic Spirit and irreverent humor from ancient, perennial and contemporary sources of wisdom. He continues to create provocative poetry, win international Poetry Slams and work for peace in a city that has known some desperate seasons and dark, embattled times.